It may feel strange to ask for things in writing from your boss. Do it anyway. When you have something in writing, there is no denying it. What should you get in writing? Everything! Whether it is a day off that you requested or a salary raise you were promised, ask your boss to put it in writing. Why do you need to put all of these things in writing? If a boss is that toxic, there is a high likelihood they are doing something illegal and you may need these documents in court later on. If you are experiencing bullying, humiliation or anger outbursts from your boss, you need to talk to your human resources department. Explain the impact the bullying has had on your physical, emotional and mental health along with how it has negatively impacted your work performance. It is not your job to deal with your toxic boss yourself; bring in reinforcements. Use your documentation of their behavior as evidence. If the human resources department is not receptive to your concerns, it’s time to move on to the next step: finding a new job. The strategies above are really just stop-gap measures as you search for a new job with a healthy environment. 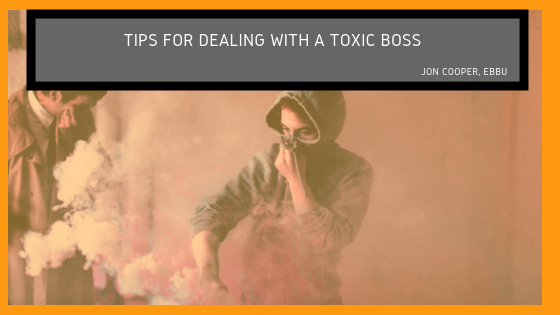 No one should have to deal with a toxic boss on a daily basis. If it’s getting to the point where you are regularly experiencing anxiety and/or depression because of this person (or the overall work environment), quit as soon as you safely can. If you are not in a financial position to up and quit, take the next job that if offered to you. It may not be a forever job, but it will certainly be less stressful than your current situation. If you are dealing with a toxic boss, it is taking a physical, mental and emotional toll on you. It doesn’t have to be this way! Rather than just accepting the behavior, you have options. First, get everything in writing. Second, go to the human resources department with your concerns. Lastly, consider looking for a new job. What I would do differently if I was bullied again by a boss?